Every story needs goals, motivations and conflicts. Without them, you don’t have a story. Without good ones, your reader will be bored stiff if you even get published. However, this can be the toughest aspect of fiction writing. GMC, if not done right will most likely get a manuscript rejected. 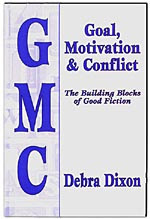 In Goal, Motivation & Conflict Debra Dixon does an excellent job of guiding the fiction writer through this maze. The presentation is clear and down to earth with relevant examples that you can put to work immediately. Before I read this book I thought I understood GMC. But I was wrong. This book put everything into perspective in an easily informative, enjoyable format. The book GMC belongs on every fiction writer’s bookshelf. Goal, motivation, and conflict are the foundation of everything that happens in the story world. Using charts, examples, and movies, the author breaks these key elements down into understandable components and walks the reader through the process of laying this foundation in his or her own work. Learn what causes sagging middles and how to fix them, which goals are important and which aren’t and why, how to get your characters to do what they need for your plot in a believable manner, and how to use conflict to create a good story. GMC can be used not only in plotting, but in character development, sharpening scenes, pitching ideas to an editor, and evaluating whether an idea will work. Be confident your ideas will work before you write 200 pages. Plan a road map to keep your story on track. Discovery why your scenes aren’t working and what to do about it. Create characters that editors and readers will care about.